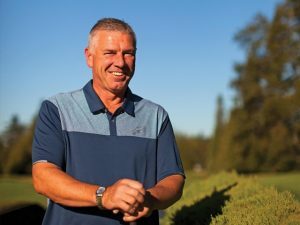 Brian Youell, the golf course superintendent at Uplands Golf Club in Victoria, British Columbia, Canada, has been selected as the recipient of the 2018 Leo Feser Award from the Golf Course Superintendents Association of America (GCSAA). Now in its 41st year, the award is presented annually to the author of the best superintendent-written article published in Golf Course Management, the association’s flagship publication, during the previous year. Youell, a 21-year member of GCSAA, authored the story “Down, but not out,” which was published in the November 2017 issue of GCM (https://www.gcmonline.com/news/brian-youell-traumatic-brain-injury). His story focused on the very personal challenges that he encountered following a serious head injury suffered on the job, the long road to recovery that he endured and how the experience changed him, both personally and professionally. Youell’s story was a follow up to a story published in GCM in September 2011 (“Aftermath of an accident). “I wrote this article to help others,” Youell said when asked about his motivation for writing a follow-up story. “I suffered in silence for many years. It wasn’t until I started to speak publicly about overcoming adversity that I realized there were so many others who were going through personal challenges. I wanted to let them know they weren’t alone and to reach out.